Today, I’m dishing on one of my favorite topics, clothing-slash-fashion-slash-cuteness. I firmly believe that your outfit sets your entire tone for your day, or your race. If you feel like you look good, your confidence naturally rises and you feel better able to meet whatever challenges you may face. It’s a philosophy shared by Skirt Sports, which is the main reason I signed right up when they offered me a skirt to try out. It’s called the Lioness, and it’s new this fall. This color is called “Razz”. Also? IT’S SUPER CUTE. I love the pattern in the contrast fabric. The back is as cute as the front! I only had one reservation about the skirt. After looking at their adorable clothing online, I was wondering about the price. I mean, the price is comparable to other companies making similar garments, but the seamstress in me always asks two things: can I make it myself (and then show you how to make it), and is the price fair given the quality of the garment? Is it made well? It is going to hold up over many races and washings and trips to the dog park? After getting the skirt home and really inspecting its construction, I’m a firm believer that that price is worth every shinny penny! It’s so nice to be able to say that! I’m a stickler for quality construction, and I can’t tell you how often I shake my fist because the new shirt I bought two weeks ago already has a button missing. 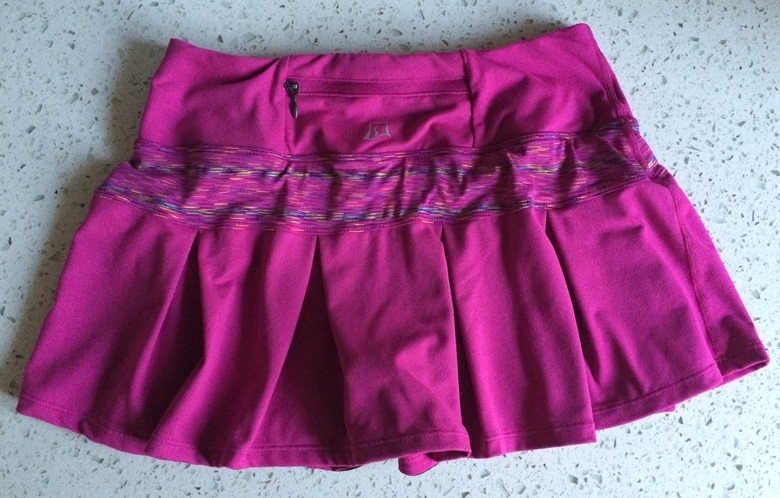 SkirtSports surprised me with the quality of the skirt. Their garments are made in Cambodia, and the skirt far surpassed items I’ve examined from other high-end athletic wear companies. It would cost me well above the retail cost of this skirt to make it myself when I factor in time and materials. I love it when you can get more than you pay for! 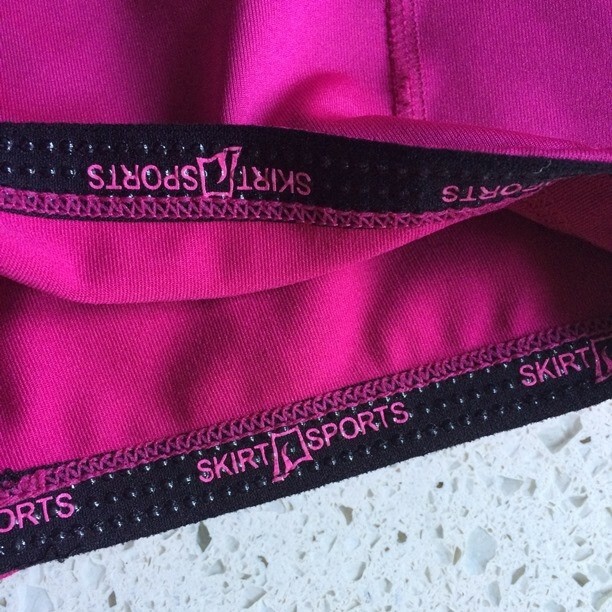 Well done SkirtSports! Encased elastic makes it much more comfy. Rubber nubs keep the shorts in place on your leg without chaffing. One of my favorite features is the pockets. 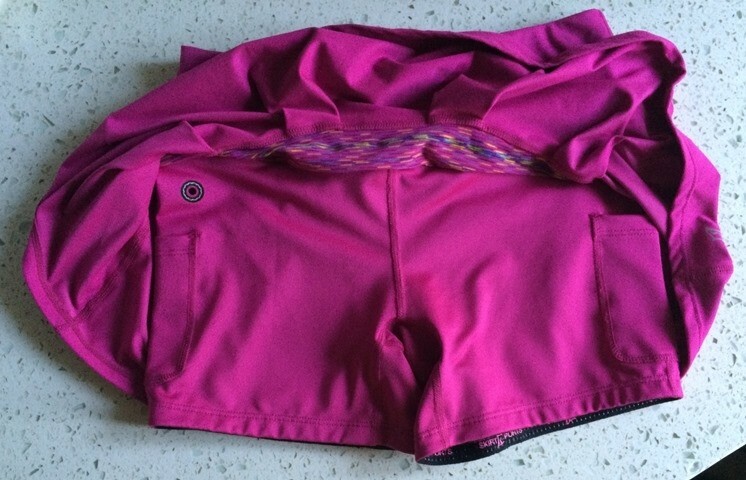 There is a zippered waist pocket in the back and a side pocket on each leg of the shorties. The right pocket has a reinforced hole to feed your headphone wire through. This skirt had plenty of room for my key, ID, phone, earbuds, and my stupid inhaler. I still had room for an energy gel or two if needed. I would like the waist pocket to be a little bit bigger, but that’s just because it seems like I’m always carrying a lot of stuff. The other plus for me is the built in shorties with the silicone dot grippers. Now for the real test, wear-ability! I donned the outfit I want to wear for my second half marathon this coming Saturday. Head to toe: Headsweats visor (thanks Vic! ), Champion running shirt, the most adorable running skirt ever, a slick pair of neon pink PRO Compression socks, and my New Balance kicks. I snapped a few goofy photos of which I’m required to share at least one, and I was off! I went for a 3 mile run in 90 degree heat. The skirt was so comfortable and cool. It held all my stuff and my stuff didn’t annoy me. 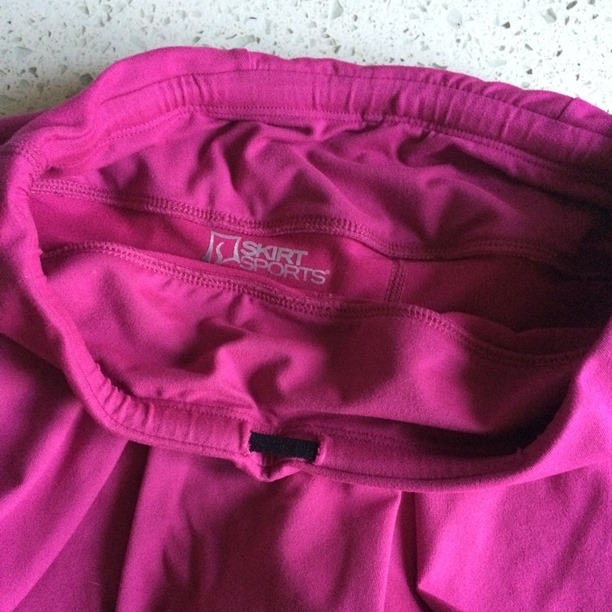 The silicone grippers on the shorts kept them in place and I wasn’t constantly adjusting…anything. It was so great to not feel encumbered by a bunch of stuff because everything was in its place nice and snug and my hands and arms were free. FREEEE! 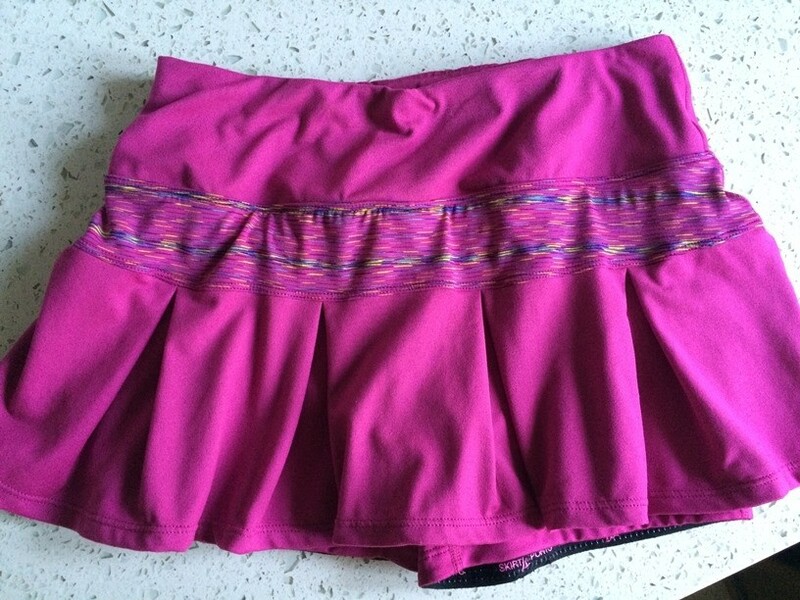 I’m pretty sure I’ll be sporting this skirt at my race this weekend, and as I climb 400 feet in elevation over two and half miles, I’m hoping this skirt will make me feel as powerful as its namesake! Do you prefer running skirts to shorts or pants? Do you have feelings about looking cute on the course? Do you wear make-up when running, or only when it’s part of the costume? Tell me all about it in the comments! *Skirt Sports gave me this skirt to try for the purpose of reviewing it. No other compensation was given. This entry was posted in Road Tested and tagged #realwomenmove, 1/2 marathon, health, healthy living, Jenn, product review, run, running, training. Bookmark the permalink. Absolutely a super cute skirt! I love the color and more importantly, I love that it works for you. 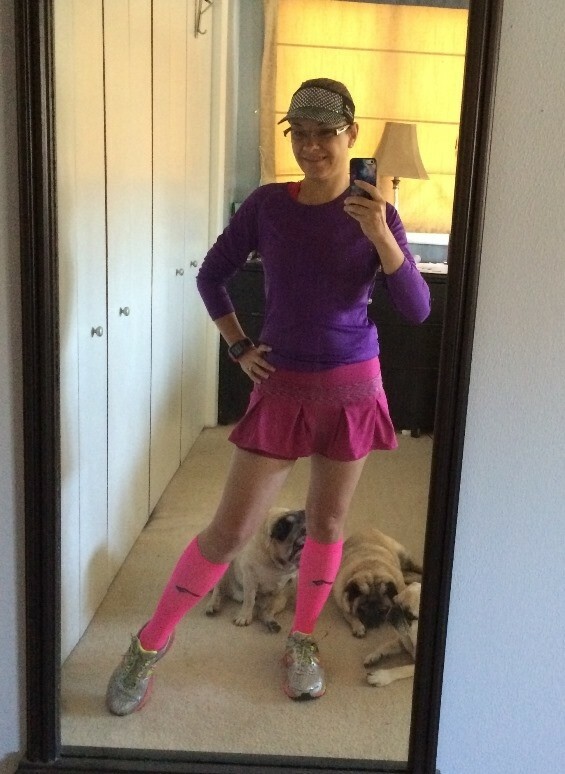 I have a few running skirts that I wear regularly; I love the option of looking cute and feeling confident. Cannot wait to hear all about your next half! Totally cheering you on from here. I know you’ll be amazing and strong. I usually wear capris. I’ve lost 100lbs and my legs took the brunt of most of that weight loss…they are pretty floppy lol so I think I’d be really uncomfortable running in shorts or a skirt, I feel like they’d ride up! But this skirt looks awesome with the grippers! I just might give it a try! Congrats on your weight loss, that’s amazing!!!! The grippers make a HUGE different, Rachel! But FYI Skirt Sports also makes capris which are next on my to-have list. I love running in capris, too, and theirs still have all the nifty pockets! I only recently started to “convert to skirt” after my cousin turned me on to Skirt sports. I LOVE the “flippiness” of this skirt but I think it would be a bit short for me. I do the Gym Girl Ultra and the 5″ shorts juuuuuuust cover my thigh rub. Totally love the colors here, as well! On the course, I don’t wear make up. I usually shower in the morning before a long race (half marathon, etc) to wake me up, and do take time to put a cute braid in or a sparkly headband, but no make up generally. I love the flippiness of it too! Makes me feel young and cute and fierce. Aren’t the colors great? It comes in other colors too. They offered me a choice between the razz and black and I had to go with the razz! It’s perfect for dancing on the course! I’m with you on the make-up unless I’m in costume! You shower routine sounds like a great idea, I may have to try that this weekend! So Cute! I love the deep pink color. Thanks for the great review!